Welcome to the website of the Dutch Fortress Museum, a place where you can touch history. The Dutch Fortress Museum is situated in Naarden, the best preserved fortified town in The Netherlands and famous for its unique star shape with double ramparts and moats. On the outdoor terrain of this Heritage Site a collection of historical cannons is on display. 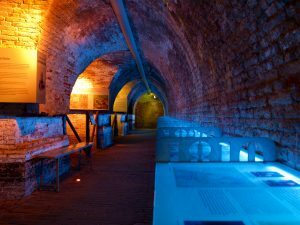 With exciting exhibitions in four casemates you can learn about the importance of fortresses and fortified towns in Dutch history.